REDWOOD CITY, CA (September 23, 2015) — For the first since time the recession, median CFO pay at S&P 500 companies increased more than CEO pay, according to a new report from Equilar. In 2014, total direct compensation for CFOs at S&P 500 companies increased 3.8% to reach $3.3 million, up from $3.2 million the year prior. Meanwhile, CEO pay at S&P 500 companies increased just 0.9%—totaling $10.3 million, up from $10.2 million the year before. Even though CEO pay remained much higher overall, median CFO pay in the S&P 500 increased $119,237 in 2014, while median CEO pay increased just $95,135 year over year. 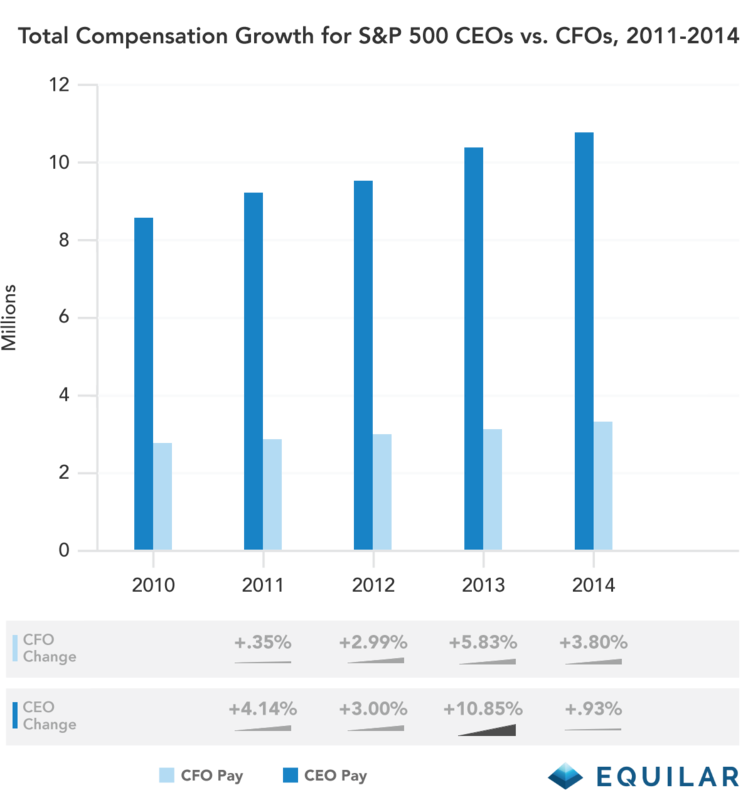 Complete pay data for 2008 and 2009 wasn’t included in the study period for this report, which reflects the past five years of CFO compensation in the S&P 500. Equilar’s historical research shows that median CFO pay fell 3.1% in 2009, while CEO pay dropped further, down 7.9% that year. That was the last time CFOs performed better than CEOs in terms of pay change at the median. In 2010, CFO compensation rebounded with a 26.1% increase, which was lower than 28.2% growth for CEO pay. The rise in CFO pay levels has paralleled continuous improvements in stock market performance over the past few years, aligning with the trajectory of growth in the S&P 500 stock index value in each of the last five years. For example, 29.6% growth in the S&P 500 stock index in 2013 corresponded with the highest rate of CFO pay growth during the study period, a 5.8% uptick in median CFO pay that year. In 2014, stock index values increased another 11.4%, and likewise CFO pay levels rose again. Meanwhile, CEO pay growth has had less of a direct correlation over that period.